This disc is something of a departure for the Yoke Shire guys. First it is (nearly) all acoustic and not rock at all. Second, it is all 'covers' of traditional Irish songs. Some of these tunes will be familiar only to folk enthusiasts but the more famous ones will be known by almost everyone. The arrangements are fairly traditional and the result is a very convincing Irish album (by two brothers from New England!). I enjoyed this from beginning to end and anyone who likes traditional Irish music will love it. They could have gone into Clannad or even Horslips territory. That would have been the obvious thing for a band like Yoke Shire to do and they are certainly capable of making an album like that (and we would all have enjoyed hearing Yoke Shire type versions of songs like this), but they chose instead to go the very opposite direction into very authentic folk sounds and arrangements. The result is simple, intimate, heartfelt and, ultimately, moving. If I'd been a little drunk when I heard this I may even have gotten a little weepy when they did "Danny Boy" and "When Irish Eyes Are Smiling" and I'm not even Irish! (But I am 1/4 Scottish which might explain it.) Certainly recommended to Yoke Shire fans but also to Irish folk enthusiasts. Comes with a free 5" Yoke Shire sticker in the shape of a shamrock! 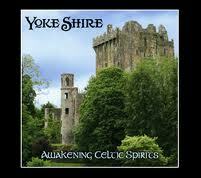 Notify me of updates to Yoke Shire "Awakening Celtic Spirits"